[Jesus said,] "In a little while you won't see me anymore. But a little while after that, you will see me again." Some of the disciples asked each other, "What does he mean when he says, 'In a little while you won't see me, but then you will see me,' and 'I am going to the Father'? And what does he mean by 'a little while'? We don't understand." Jesus realized they wanted to ask him about it, so he said, "Are you asking yourselves what I meant? I said in a little while you won't see me, but a little while after that you will see me again. I tell you the truth, you will weep and mourn over what is going to happen to me, but the world will rejoice. You will grieve, but your grief will suddenly turn to wonderful joy. It will be like a woman suffering the pains of labor. When her child is born, her anguish gives way to joy because she has brought a new baby into the world. So you have sorrow now, but I will see you again; then you will rejoice, and no one can rob you of that joy." 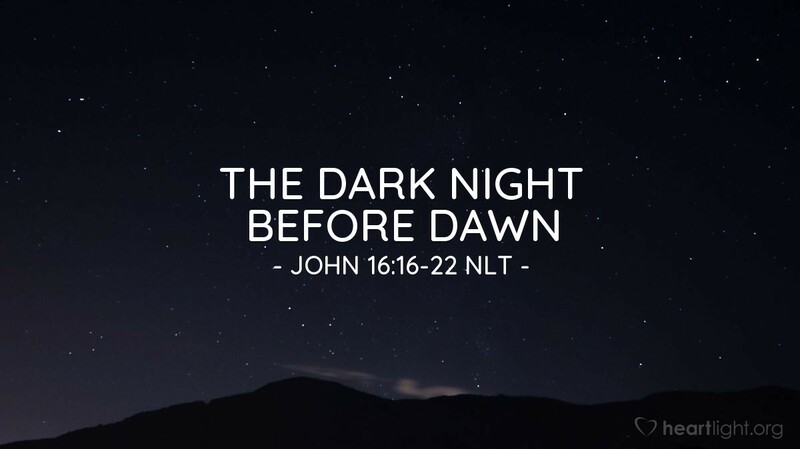 Jesus knows that darkness will descend on himself and those he loves. He has tried to prepare them. They cannot imagine what the next four days will entail. They will go from excruciating agony to inexpressible joy. When we face our dark nights, we need to remember that the Holy Spirit who lives in us is our assurance of a dawn of joy, blessing, and triumph. Give me courage in my darkest moments, O Lord my Father and God, to trust that you are the Father of the dawn and the gracious God who raises triumph out of defeat and joy out of sorrow. Please bless the following people who now face the darkness in their lives: ... Strengthen them and bring them the dawn of joy in your grace. In Jesus' name, I pray. Amen.